One of the first things I did after bringing home that sack of super-ripe peaches was to sort through them and turn the bruised and battered ones into peach butter, stat. I took the easy route and used my crockpot, which has seen more action in the past 3 months than the prior ten years combined (though not for cooking full meals). I basically just diced up the peaches and chucked them into the pot—skin, pits and all—with some whole spices, a handful of flaked coconut, and some organic sugar. This mixture stewed all night long, and when I got up in the morning to check on it, the peaches were so brown that I thought at first that I had overcooked the batch and ruined it. After pulling out the spices and pits, I poured the slightly scary-looking mixture into my blender to puree and decided it looked a lot like apple butter and might not be all bad. A taste confirmed that the sugars in the peaches and coconut were pretty thoroughly caramelized, giving the butter a mildly bitter undertone that actually played well with the spices and peachy tang. I ended up adding a little more sugar to balance it out, but in hindsight, I wish I had used honey instead. I ended up with a quart of almost sweet-sour-savory peach butter, and I have a sneaking suspicion that it will be an incredibly versatile condiment. I have such a sweet tooth that I might want to doctor up my servings with some extra honey before slathering it on bread or stirring it into yogurt, but I have already used it as a glaze on wild salmon with no alterations. I gave the salmon an hour or two to marinate in a dry rub of sweet yellow curry powder, garam masala and salt, then brushed it liberally with the peach butter and threw it in a 450F oven for about 15 minutes. The peach butter caramelized on the salmon without burning, and harmonized perfectly with the curry flavors. 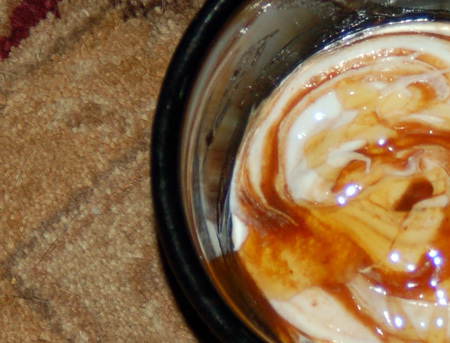 I’m not done yet—look for more uses for this peach butter over the next few days! This post is linked with Real Food Wednesday and Simple Lives Thursday. Dice up the peaches and throw them, skin, pits and all, into your crockpot. Chuck in the remaining ingredients, give it all a good stir to moisten the sugar, and set your crockpot to low for anywhere from 8-12 hours. (This is a good one to do overnight, because you wake up to a fabulous smell in the morning.) The peaches should be a warm brown color. Turn off the crockpot and allow the mixture to cool slightly. Remove the pits and whole spices if using a blender (you can tie these into a little piece of cheesecloth up front if you don’t relish the thought of spice hunting at the end); if you are using a food mill, you can save yourself that step. Ladle part of the mixture into a food mill or blender to puree; I used the latter and found it necessary to hold the lid on with a towel protecting my hand as my peaches were still on the hot side, then strained the puree for a smoother end product. When your butter has been pureed, taste it and test the consistency by placing a dollop on a plate—it will be watery around the edges if it needs more time. My butter was not sweet enough for my taste, so I added another half cup of sugar at the end while it was still quite warm; you could also sweeten it with honey or maple syrup if you think it needs adjusting. Thanks to the incredible juiciness of the peaches I used, my butter was also on the thin side, more like barbecue sauce than a thick spread; I opted not to cook it down further, but you may want to transfer the puree to a large saucepan to cook off any excess liquid. Essentially, tweak to your personal preferences. Makes about a quart of peach butter. Use as a jam-like spread or yogurt flavoring, or include in pretty much any recipe that could benefit from a fruit puree: Cakes, muffins or other quick breads, pancakes, glazes and sauces for meat and fish, barbecue sauce, salad dressing, ice cream and sorbet, compound butter, and more. I’m very tempted to spread some thin on a silpat to see how it tastes as a fruit leather. If you don’t think you can use it all up in one shot, it can be canned or frozen; my silicone muffin pan makes perfectly sized peach butter hockey pucks, although they stay quite soft due to the sugar content, and you could tuck some sliced and diced fresh peach into the butter before freezing for extra oomph. 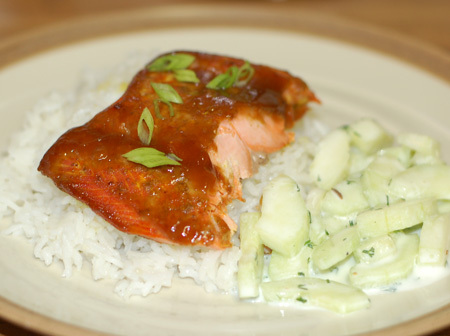 I served this salmon with rice and a light yogurt-dressed cucumber salad from Wolfgang Puck, scaled down to use just half of a large local cuke. I went much heavier on the dill than he did, because I love it so. Spray a baking dish with oil and preheat your oven to 425F. (If you are making a cucumber salad, you will want to get it mixed up before the salmon so it has time to meld. Mix together the curry powder, garam masala and salt; rub all over the fish on both sides. Brush the peach butter all over the fish, then bake in the oven for 10-15 minutes, until the fish is done to your liking (we don’t do medium salmon, thank you) and the peach butter has caramelized slightly. Serve with rice and veggies. I just made peach mango butter a few days back. Now I’m working on making more jam or butter with a full case of peach seconds. I never thought of using the peach butter on salmon. The peach and spices sound like they would taste great with the salmon. Thanks for posting the recipe! Salmon is on sale this week. Can’t wait to try it! Glad to provide some inspiration, Penny! Your peach-mango butter sounds heavenly. I’m trying to decide what to do with the last of my peaches, all peeled and diced up in the fridge, and I’m so torn between just freezing them or making them into more butter—I’ve already used up half my stash! This peach butter looks so good! I really cant wait to try this! Looking at your roasted chicken makes me sooo hungry.I saw your blog from the foodie blog roll and I like what you have here.if you won’t mind I’d love to guide Foodista readers to this post.Just add the peach widget to the end of this post and it’s all set, Thanks! 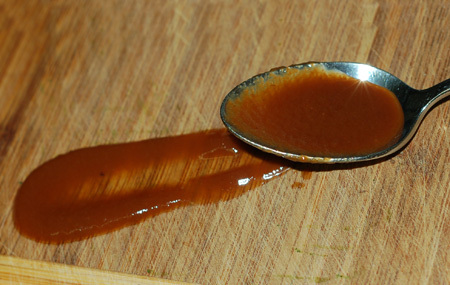 I love this idea – I just made bbq sauce tonight from apricots! Thanks for linking to Simple Lives Thursday. Thanks for stopping by, Torview!